There has been a blossoming of research into fiscal incidence by income class. This column combines century-long histories for Britain and South American countries with previous research to offer a global history of government income redistribution. Contrary to some allegations, the shift towards progressivity in government budgets over the last 100 years has not been reversed since the 1970s. The rise in inequality since the 1970s therefore appears to owe nothing to a net shift government redistribution toward the rich. What would the wealth distribution look like without redistribution? Inequality and redistribution: why such a weak link? Government budgets have shifted resources progressively, from the rich to the poor, within the last 100 years. The middle ranks are neither favoured nor disfavoured. Before WWI, very little was redistributed through government. The shift toward progressivity has not been reversed, contrary to allegations of a rightward shift since the 1970s. Among democratic welfare states, the closest thing to a demonstrable reversal was Sweden’s partial retreat since the 1980s. Globally, the most dramatic swing has been Chile’s record-setting return towards progressivity after the regressivity under Pinochet. As a corollary, the rise in inequality since the 1970s owes nothing to a net shift in government redistribution toward the rich, despite the lowering of top tax rates. Since the late 1970s, several governments have shown a mission drift away from investing in lower-income children and working-age adults, while concentrating social insurance on the elderly. Japan, the US, and some Mediterranean countries have missed an opportunity for pro-growth income-levelling. What triggers the new history is the 2016-2017 blossoming of research programmes on fiscal incidence by income class, led by Bengtsson et al. (2016), the Commitment to Equity (CEQ) project (Lustig 2017), the OECD (2011, 2016, forthcoming), and the Distributional National Accounting (DINA) project (Piketty et al. 2016). After combining and extending these, I have added century-long histories for Britain and South American countries (Lindert 2017). The recent research on government redistribution has concentrated on the 21st century. Combining the latest snapshots from the CEQ and OECD projects yields the group photo of 53 countries around 2013 shown in Figure 1.1 The progressivity of government fiscal redistribution is measured by the gap between the Gini coefficient of inequality in market, or ‘pre-fisc’, income and the Gini coefficient for final, or ‘post-fisc’, income. That gap shows up in Figure 1 as the distance between the 45-degree line and the country’s dot. That gap is smallest for Mexico, and largest for Ireland. All 53 data-supplying governments redistribute progressively today, placing their dots below the 45-degree line. Probably many other countries do as well, though there may be some who silently redistribute regressively, from households at the bottom to those at the top (North Korea, maybe?). Regions differ. Most Latin American governments do little to offset their countries’ high inequality of market incomes, with Argentina being the clearest exception. In East Asia, Japan and South Korea also do little to redistribute income from rich to poor, but they have much less inequality of market incomes in the first place. Widespread progressivity is less than 110 years old. Back in 1910, redistribution hardly favoured the poor at all. No country had sizeable direct taxes or transfers, as implied by Figure 2. To underscore how little was given in any country, consider a clear overestimate. Suppose that all direct taxes came from the very top income ranks (untrue), and that all social transfers were given over to the very bottom income ranks (also untrue). The most that could have been transferred from top to bottom is the lesser of these two shares of GDP. In 1910, that was only 2.7% for Britain, and less than 1.5% for every other country. Compare this with today’s (c2013) Gini coefficients. Of the 53 countries in today’s group photo, only Mexico, Turkey, and Korea redistribute as little from rich to poor as did Britain, the progressive leader back in 1910. There have been some retreats from progressivity along the way, but in most cases the lost ground has been regained since. Chile’s famous shift to regressivity after 1973 has been dramatically reversed since the return of democracy after 1989. The Thatcher-Reagan revolutions were also limited and temporary. As suggested by Figure 2, neither of them erased the whole century-long rise of progressivity, and both have since been completely offset by the return of the gradual trend toward progressivity. Among democracies, Sweden is the one clearly quantified case of a country with an enduring retreat from progressivity. Back in 1983, its taxes and transfers shifted enough resources to reduce inequality by 20.5 Gini percentage points. By 2009, this redistribution had retreated to 12.3 percentage points, and no upturn of progressivity is in sight, even though the 2009 redistribution from richer toward poorer still exceeds any achieved by Sweden since the 1970s or earlier. Interestingly, the US has continued to creep toward progressivity, helped by the rising importance of workers’ Earned Income Tax Credit and the increasing use of food stamps. For other countries, do the latest trends point toward more redistribution or toward less? The results since the 1980s suggest stability and convergence in governments’ redistribution. On the one hand, no global renewal of the 20th century’s global rise of progressivity is foreseeable. The forces that have ushered in that century of redistribution – the rise of average incomes above subsistence, the improvement of governments’ ability to tax, and the spread of political voice for the masses – have reached their foreseeable limits, at least for the rich industrialised democracies. On the other hand, there is also reason to doubt that there has been any widespread retreat toward governments’ redistributing incomes from poor to rich. The OECD’s estimates for about a dozen countries from the mid-1980s to about 2013 show no net change in redistribution, once one has adjusted for cyclical effects. The lack of any clear retreat to regressivity since the 1970s or 1980s implies an important corollary for the debate over the disturbing rise of overall inequality in this same era. None of this rise is due to a net shift of government budgets towards helping the rich at the expense of the poor. The entire net rise of inequality must have been due to changes in the market economy, such as technological bias, globalisation, and/or trends in human capital. Scanning the horizon for possible regressive influences on government behaviour in the near future, one should fix one’s gaze in the direction of the treatment of age groups. Since the 1970s, a few countries have exhibited mission drift in their social spending policies, under-investing in lower-income children and those of working age, and relatively overprotecting the elderly. While every country has dramatically reduced poverty among the elderly, Japan, the US, Portugal, and Greece have been particularly remiss in raising the income floor for younger age groups. Authors’ note: Based on the Fifth Angus Maddison Development Lecture, OECD, 3 October 2017. The Working-paper version is Lindert (2017). The author thanks Orsetta Causa, Marc Fleurbaey, Mikkel Hermansen, Kathy Lindert, Nora Lustig, Eugene Smolensky, Daniel Waldenström, and Jeffrey Williamson for helpful comments on earlier drafts. Atkinson, T and S Morelli (2014), “The chartbook of economic inequality”, VoxEU.org, 26 March. Bengtsson, N, B Holmlund and D Waldenström (2016), “Lifetime versus Annual Tax Progressivity: Sweden, 1968–2009”, Scandinavian Journal of Economics 118(4): 619-45. Lindert, P H (2017), “The Rise and Future of Progressive Redistribution”, Commitment to Equity (CEQ) Institute Working Paper 73, Tulane University. Lustig, N (2017), “Fiscal Policy, Income Redistribution and Poverty Reduction in Low and Middle Income Countries”, CEQ Working Paper No. 54. OECD (2011), Divided We Stand: Why Inequality Keeps Rising. Paris: OECD Publishing, Chapter 7. OECD (2016), Downloadable update of the OECD Income Distribution Database. 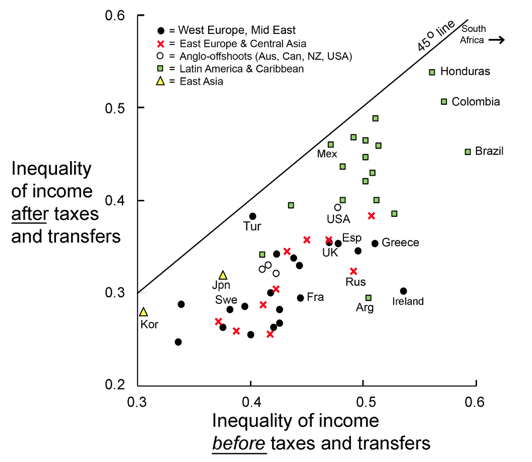 OECD (forthcoming), Income Redistribution through Taxes and Transfers across OECD Countries. Paris: OECD Publishing. ECO/CPE/WP1 (2017) 21. Piketty, T, E Saez, and G Zucman (2016), “Distributional National Accounts: Methods and Estimates for the United States”, NBER Working Paper No. 22945 (including its links to online appendices).. The two sources have used different measures. For the usual OECD countries, the OECD (2017 and earlier studies cited therein) omitted transfers in kind such as public education and public health, and restricted its estimates to the population of working age. The CEQ, by contrast, included in-kind transfers and the elderly in its measures for Latin America, Asia, the Middle East, and South Africa. The difference in perspectives should not have affected the estimates of net redistribution enough to change any qualitative conclusions here. This statement sets aside the countries where communist regimes have broken up. Presumably many of them experienced regressive shifts in income redistribution in the process, though these are hard to quantify. OECD (2011, 2016, forthcoming). The forthcoming OECD study will disagree with my interpretation of their data. Yet the seeming decline stems from some biases in presentation. Their study has chosen to set aside the rise in progressivity that their data showed from the mid-1980s to the mid-1990s, instead emphasising a decline in progressivity from the mid-1990s to about 2013. 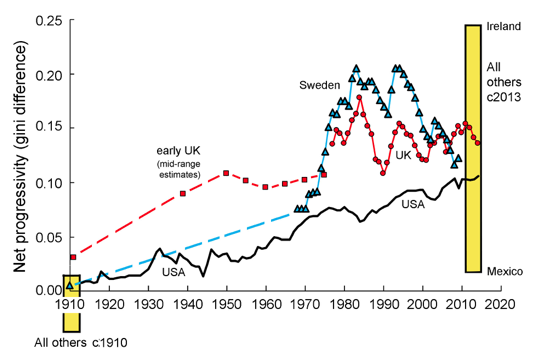 Furthermore, at their chosen starting point in the mid-1990s, the Nordic countries showed high progressivity simply because they were in crisis at the time. The longer comparison of the 1980s and the 2010s is more cyclically neutral, and shows no clear trend.